MSAN taps into students, principals, teachers and district leaders to learn the best practices to close opportunity gaps. Guery Ulunque has come a long way since he first landed in the United States from Bolivia with his father and sister in 2008. The now-18-year-old senior at Yorktown High School in Arlington, Va., recalls his struggles. During his early years in the U.S., Ulunque could not have imagined taking the stage and confidently speaking—in English—to hundreds of educators and students from across the country. Yet, just last year, Yorktown High School social studies teacher Anne Stewart selected Ulunque and two Latino classmates to present at the spring conference of the Minority Student Achievement Network (MSAN). They shared their experiences in the school’s first-of-its-kind program for minority boys, inspired by Stewart’s participation in MSAN. “It felt really great to represent my school, my Latino community and Hispanic culture. And my dad was really proud of me, too,” remembers Ulunque. MSAN is a national coalition of suburban-urban school districts that work together to narrow racial opportunity and achievement gaps that persist in their schools. Launched in 1999, it is a project of the Wisconsin Center for Education Research within UW Madison’s School of Education. In addition to engaging in collaborative research, it hosts three well-attended conferences every year: the MSAN Institute for educators each spring, the annual MSAN Student Conference in the fall and often a mini-conference in early winter. It was the 2013 MSAN mini-conference that spurred Stewart to reach out to Yorktown’s underrepresented students. Out of a total student population of 1,800, only 5.7 percent are black and 15.7 percent are Hispanic. 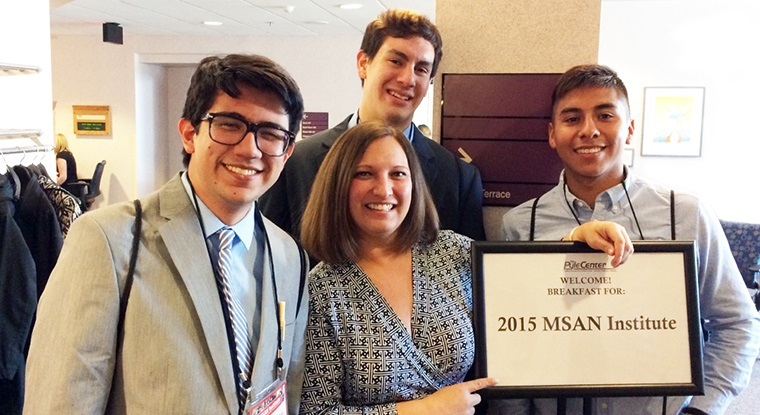 Guery Ulunque (left) and classmates pose with their teacher, Anne Stewart, at the MSAN Institute last year. With the buy-in from school administrators, Stewart started holding monthly MSAN meetings during the school day—an unusual arrangement, but she says it was the only way to ensure high attendance. These 45-minute meetings usually draw between 100 and 170 minority students, from freshmen to seniors, and mostly blacks and Latinos. “The first meeting was extremely powerful. We have so few minority students, that they are spread out among classes. So to have all our black and Latino boys in the same room at the same time was amazing. They’re looking around and thinking, ‘Ah, there’s more of us than we thought,’” says Stewart. Guery Ulunque takes a break in the iconic terrace chair during his first-ever visit to Wisconsin for the 2015 MSAN Institute. The MSAN program has changed Ulunque’s life. He met his core group of friends there and it has pushed him to excel academically. “When I was a freshman, my grades weren’t so great. Then I found out that if I wanted to be an MSAN student leader, I needed to have a 3.0 GPA or higher, so I have been working really hard to get my grades up,” he explains. The good news is, Ulunque will graduate this June with that prized and hard-fought 3.0 GPA. Unfortunately, it’s a little too late for the graduating senior to parlay it into an MSAN leadership role. “That’s OK,” he admits. “MSAN helped me get through high school and get me to where I am right now.” A soccer, wrestling and track athlete, Ulunque has set a new goal for himself—he plans to become a sports physical therapist and will attend a junior college in Washington, D.C., in the fall.